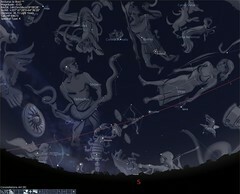 Stellarium is a wonderful freeware program that I learned about from Gene Harm's astronomy and Orbiter web site. I played with it for a few days last year but quickly went back to Orbiting. But this weekend, with the help of a couple of books and relatively clear late spring skies, I started my remedial astronomy program, then rediscovered and reinstalled Stellarium. Stikky Night Skies performed as promised for both my wife and myself - we quickly learned to spot and use as guides the Big Dipper, Orion, Cassiopeia, and Taurus, as well as a few key stars (Polaris, Betelgeuse, Sirius, Vega). Although some of these objects were already pretty familiar, we had never really used them as guides to finding other things in the sky. Some of the paper exercises were tricky "Where's Waldo" adventures with hundreds of simulated stars in various orientations. When it was time to test our new skills, the skies cooperated and we were able to spot the expected constellations and stars in our back yard (Orion and Sirius remained out of sight due to the season). Jupiter was also quite bright in the southern sky. But what were some of those other stars? A "Star Finder" wheel helped us to identify Arcturus, but there were others that we still weren't quite sure about. Enter Stellarium. It shows an accurate and easily controlled and configured view of the sky for any desired location, date, and time. It also allows you to speed up time, configure labels, and much more (the picture shows the optional constellation art overlay - more screens at Flickr). Very cool. The sky is starting to make a lot more sense. I found another great book for remedial astronomy. 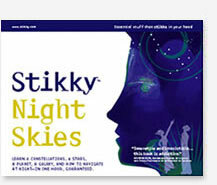 Stikky Night Skies, published by Laurence Holt Books (no author listed, apparently a team effort). The subtitle is "Learn 6 constellations, 4 stars, a planet, a galaxy, and how to navigate at night - in one hour, guaranteed." That's a tall order, but it comes through with an innovative visual approach to presenting and reinforcing the information. There are two other books in this Stikky series (trees and stock charts, oddly enough), and it looks like there are more on the way. I like this approach - taking a small chunk of knowledge and presenting it in a sequential, visually oriented, and easy to follow way. The nice thing about the sky version is that in addition to some easy to attain goals, it gives you a framework for exploring and learning more of the sky. By combining this with The Backyard Stargazer, I think this can be the summer that my daughter and I finally learn our way around the sky. We tried a couple of summers ago with a few nights of meteor shower watching and an ill-advised telescope purchase. This naked-eye approach looks much more promising. While it's obvious that there are vast numbers of "space blogs," it turns out that there are also a few others that are focused on Orbiter, so I decided to finally bring this to the attention of my readers (both of you). The original idea for this blog came from DarthVader's Fly Me To The Moon. Darth's original goal was to learn about Orbiter and space history by going through all the Apollo missions in chronological order. I think he got as far as Apollo 7 before he was drawn to the Dark Side and became an Orbiter add-on developer focused on Soviet era rockets and spacecraft (that's not really especially "dark," but come on, Darth Vader?). He's got some amazing works in progress as shown in the Soyuz picture above, with more examples on his Flickr site. Another blog I just discovered actually pre-dates mine, Kodiak's Space Contraptions. Kodiak has done a number of cool add-ons for Orbiter, but his latest one (soon to be released) looks amazing. It's the air-dropped booster and crew transfer vehicle (CXV) from t/Space. More pix on Kodiak's Flickr site. There are two other notable Orbiter-related Flickr sites that I know of, Simcosmos (with add-on development and source pix as well as Orbiter shots) and Sir Mildred Pierce (some 30 very cool Orbiter screen shots). The Yiddish title above is that of a song that was a big hit for the Andrews Sisters in 1938. It means "to me, you're beautiful." I'm not sure that the late Russian Mir space station was exactly beautiful, but it must have been a striking sight at the very least. I saw the photo above (left) in a book of photographs by NASA astronauts, and I tracked it down on the web. It was taken from the Atlantis on STS-71 in July 1995. I decided to see how well I could match it in Orbiter, using EndeavorCmdr's very cool atmospheric enhancement (basically a new horizon texture and adjustments to some atmospheric color parameters in the Earth.cfg file). While the clouds and Mir's orientation aren't quite right, the overall look is pretty close. You can see larger versions of the photos at Flickr (the NASA photo is only available at 640x480 as far as I can tell, and I have cropped it). I've been working with Andy McSorley, Mark Paton, and Grant Bonin on an Orbiter add-on to simulate the MarsDrive Consortium Mars for Less (MFL) mission (work in progress, more info here). 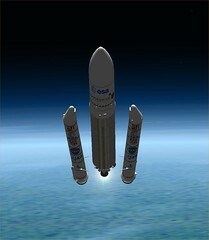 Andy just sent over his latest mods to the Ariane-5 booster (I like the logos) and his "Proteus" modular booster stage. Four of these 25 tonne modules will be assembled (possibly by remote control) in LEO and mated to one of two Mars bound spacecraft, the initially uncrewed ERV (Earth return vehicle) or the crewed MTSV (Mars transfer and surface vehicle). The spacecraft are Mark's area, still in progress (I've shown some sneak previews in earlier posts). For the complete MFL story, see the MarsDrive web site. I installed EndeavorCmdr's recent "atmospheric realism" enhancement, and while it does have a few small artifacts I'm not sure about (e.g., the visible steps in the horizon gradient), those deeper blues do make the screen shots a lot more reminiscent of astronaut photos of the Earth (especially from the Gemini era). More pix on Flickr. Weighing in at a mere 8.1 KB, Artlav's new InterMod autopilots module packs a lot of punch. Just updated for Orbiter 2006, this add-on is simply a small DLL that gets activated in the Modules tab of the Orbiter launchpad. It doesn't require an MFD and doesn't have any on-screen display (other than a switchable debug readout in the lower left corner of the screen). What it adds is several new autopilot command keys analogous to Orbiter's built in ones such as kill rotation, horizontal-level, and auto hover. One is "kill translation" (numpad-7) which is an analog to kill rotation (numpad-5) and which zeroes out translation components relative to the nearest vessel. Other keys include V for vertical auto-hover (used to hold a "tailsitter" spacecraft which lacks hover engines in an automatic hover using the main engines) and C which holds vertical orientation (i.e., nose pointing at zenith, typically used with V). There are also finer resolution controls for hover engines and a few other features. Simple but elegant. I like Discover magazine, but I have to accept it for what it is - "science lite," more or less. Because it tends to be detailed and technical, science can be a tough sell for the general reading public. Discover's approach is to focus on the human interest side of science stories, without a lot of technical detail. And for me, that's OK for most subjects. I know it's not the final word, but I learn about a lot of things in more depth than I usually get from the web or Newsweek. But sometimes Discover's approach can be overly dramatic. The cover story (subscription required) of the June 2006 issue features the headline "Are we trapped on Earth? Why cosmic rays could prevent us from leaving" (i.e., leaving for long-term flights to Mars and beyond). The story (which features some great Mars surface photos) refers to new research on galactic cosmic rays and suggests that these heavy, energetic particles might contribute not only to long-term cancer risk, but also cause short term and potentially debilitating damage to human organs, most alarmingly to the brain. The key term here is might - the article mentions some of this recent research but mostly summarizes issues and concludes that there are a lot of factors that aren't known very well, some of which might interact with other factors, and some of which could be pretty scary if they happened. In The Case for Mars, Robert Zubrin talks about "killing dragons" that seem to bar the way to human flights to Mars, radiation being one of them. Zubrin estimates that the average radiation dose people will experience over a 2.5 year Mars mission (from cosmic rays and solar flares) is on the order of 50 rem, a non-trivial amount that could significantly increase the risk of various cancers, but comparable to other risks that many people take on voluntarily. He estimates that long-distance airline crews might receive half of this dose over a 25 year flying career (around 1 rem per year, 2 rem/year is a recommended limit mentioned here). This 2005 paper (PDF) suggests a similar figure, but notes that there are many factors (e.g., solar maximum vs. minimum years, time of exposure, etc. ), though it also points out that cosmic-ray intensity has varied considerably over time, and that data collected since the space era are not necessarily typical (e.g., estimated shielded dose levels in 1954 would have been ~62 rem). This 2004 NASA article ("Can people go to Mars?") gives some other perspectives. Note that a large proportion of the exposure (~75%) would occur in transit, since the atmosphere of Mars and simple shielding measures on the surface would provide substantial protection (even though Mars lacks Earth's protective magnetic field). Also see Health Physics Society FAQ on space and radiation here. My point is not that radiation exposure on Mars missions is a trivial matter, or even that it is completely understood. More research is clearly needed, and many experts believe the risks can be moderated by various technical measures. Even if they remain fairly high (as are many aspects of space flight), there will still be people willing to accept these risks as part of the price of exploration of the Solar System. Note added on May 25: Excellent discussion of this topic at Hobbyspace here. I took four semesters of Russian in college, a bunch of years ago. I really liked it and did well, but unfortunately never got to use it for travel (unlike Japanese and French), so I forgot all but a few phrases. One of them is "gde moy brat," but unless one of my siblings is kidnapped in Russia, "where is my brother?" is not a very useful phrase. 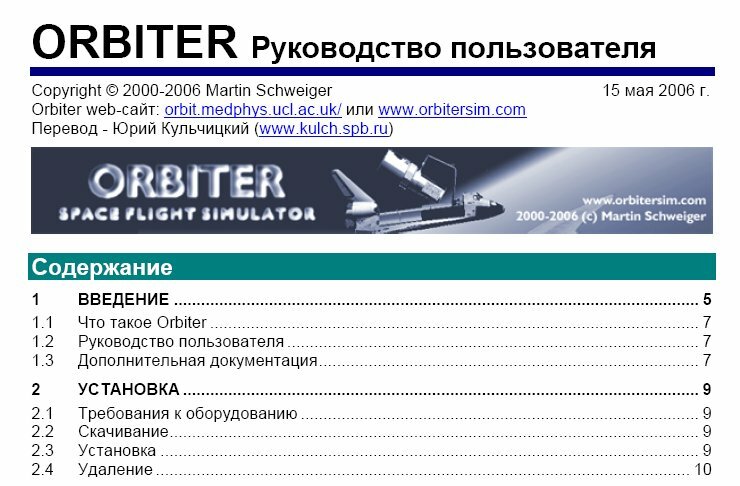 So even though it's not very practical for me, I think it's really cool that a Russian translation of the Orbiter 2006 manual is already available, thanks to Yuri "Kulch" Kulchitsky. Kulch is an amazing Orbiter add-on developer who really likes to "push the envelope" of what it's possible to do in Orbiter. In addition to "conventional" boosters such Energia, he has developed exotic systems such as mass drivers, winged boosters, and even a space elevator. Most of his add-ons are available at Orbit Hangar, but his web site has more information on works in progress as well as a screen shot gallery. Spasiba, Kulch! Simcosmos (António Maia) is an Orbiter add-on developer who also maintains the most complete collection of links to the many Orbiter-related resources on the web. From his base in Portugal, he develops and launches Orbiter models of NASA's planned CLV (crew launch vehicles) and many other experiments. Feast or famine - three posts in one day? Maybe if I type fast (almost midnight). Mars gets some really nice treatment in Orbiter 2006. Thanks to Seth Hollingsead (Iceversaka), the hi-res distribution offers amazing (but gigantic) level 10 Mars textures, as well as a standard level 8 with a level 10 area around Olympus Mons (I think he now has a level 9 as well, check his web site). Even the level 8 is quite nice, and with the addition of a large set of configurable surface feature labels (Control-F9), you can get to know Mars as you fly around in Orbiter. There are no clouds by default, but VF2_Rolf has some great cloud textures (especially #5) that work with Orbiter 2006 with just a small configuration file fix (available on his site). They make subtle but noticeable difference in the realism of Mars. Thanks to Seth and VF2_Rolf for making Mars a nicer place to visit in Orbiter 2006! 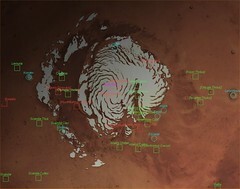 North pole shown with labels - more new Mars pix on Flickr. The headline comes from an impeccable source: a fortune cookie. Fortune cookies are an excellent source of random phrases that mean pretty much whatever you think they mean. But this one is right. Here’s another one. One day, I don't know when, but one day, there will be more humans living off the Earth than on it. It’s really incumbent on us as life’s agents to extend life to another planet. I think that being a multi-planet species will significantly increase the richness and scope of the human experience. That sounds like Kim Stanley Robinson’s character Hiroko in Green Mars (though too wordy and not quite mystical enough for her). But it’s actually Elon Musk, founder and president of SpaceX (in an interview in the summer 2006 issue of Ad Astra). It’s tough work building completely new launch vehicles and spacecraft that will eventually lower the cost of access to space, but Elon and his team are working on it. And I’m working on it too, in a much smaller way. 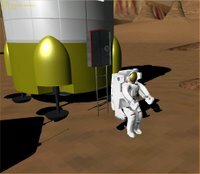 Writing Go Play In Space to help people learn to use Orbiter was a start – Orbiter is an immersive simulation of many aspects of spaceflight, allowing a “hands on” approach otherwise unavailable to anyone outside NASA or ESA. I think Orbiter can really help to build interest in spaceflight. This week I was pleased to accept the position of Educational Outreach Director for the MarsDrive Consortium (MDC). I had been working with Grant Bonin, who previously held this position along with “Missions Planning Director,” a bit too much for one person. The basic educational outreach task is “education of the public on the merits of unmanned and manned space exploration with an emphasis on Mars,” and this needs to be focused and turned into actions and materials, which I will be working on over the next few months. If you have an interest in scientific and technical education with an emphasis on space, please consider joining MDC and contributing your efforts to this or to one of MDC’s other task forces. There’s more than one way to get to Mars, and now is a good time to explore. I've been busy with a lot of things and I have a backlog of "space stuff" to blog about but just haven't had time. Perhaps this weekend, but in the meantime, I really like this essay on evolution. It's interesting that few seem to object to the theories of gravitation or relativity (or at least their applications) that allow such marvels as GPS to work (though I'm sure there is an alternate theory somewhere, perhaps navigation angels to keep the GPS satellites in orbit?). Proponents of so-called intelligent design even accept (or will at least take if they are sick) antibiotics and other drugs which are designed based on detailed understanding of bacterial genetics and practical application of the theory evolution (evolution is how bacteria develop resistance to antibiotics among other things). But they reject the idea that evolution also applies to humans, even though we share our genetic code with all the other living things on this planet. I really don't get this selective approach to scientific theories. Scientific theories are judged on their predictive, practical value, and evolution is applied practically in drug development and many other areas of medicine, biology, animal and plant breeding, etc. every day. But supposedly humans are exempt. At least in Kansas. 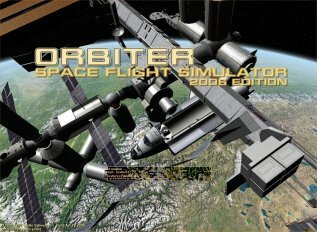 Just a note to say that the revised and expanded version of Go Play In Space was released on May 4 when Orbiter 2006 was released. As I've mentioned in other recent posts, I've been working on this for a while, with help from new co-author Andy McSorley who provided a great tutorial chapter on using IMFD to go from Earth to Mars. I also added a new chapter on rendezvous and docking, updated the chapter on add-ons, added an appendix on how to use the new Scenario Editor, and upgraded everything for the 2006 version, including new screen shots. It was a lot of work but I was happy to fix up some things that bothered me about the first edition, and to add some new material. This free ebook is suitable for ages 12 and up, though most emails I have gotten about the first edition were from much older "space kids" - so maybe I should say for kids of all ages. If you have an interest in space flight but don't know much about it, this book will lead you through the basics fairly painlessly (though I can't deny that there's a lot of detail to follow and learn). Even if you know quite a bit about space flight and Orbiter, you may find something of interest in the hands-on tutorial chapters or in the various background chapters. The new edition is 181 pages - lest this scare you away, note that the flight tutorial chapters are 14-22 pages each, and there is a 1-2 page checklist summary at the end of each flight chapter for quick reference while flying (the exception is Andy's Mars chapter, which is more of a checklist style anyway and doesn't have the summary checklist at the end). 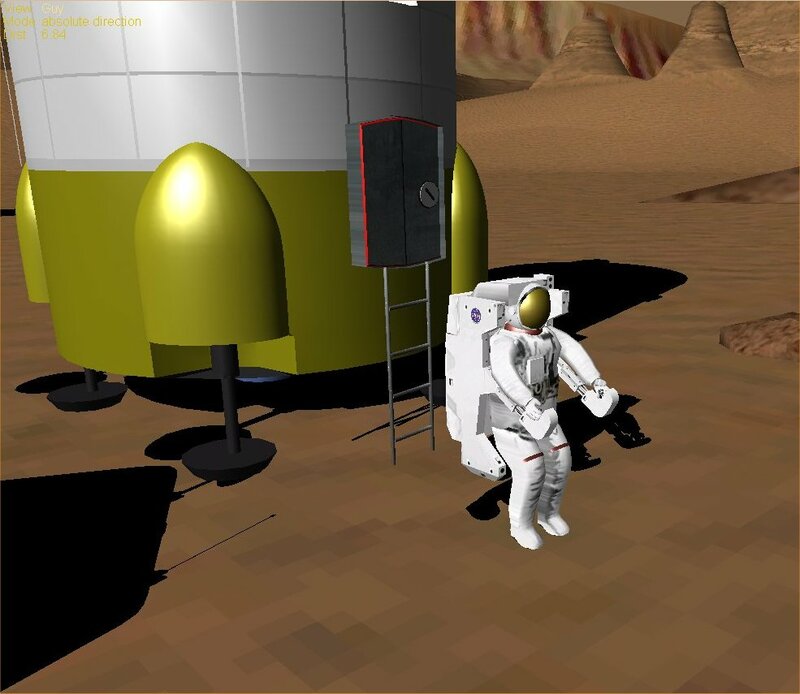 One thing that's great with Orbiter 2006 is that I was able to provide annotated tutorial flight recordings for some of the chapters (chapter 2 intro mission, chapter 4 Moon flight, and chapter 5 rendezvous/dock). These are included with Orbiter and can show you visually how it's done. Like seeing the movie before reading the book (sort of). I haven’t written too much about Orbiter the last few weeks, partly because I’ve been busy, but mostly because I’ve been on the beta testing team for the new Orbiter 2006 version. This was so I could get a head start on revising Go Play In Space for the new version (that’s one of the things I’ve been busy with). There was a lot of interesting stuff going on, but I couldn’t write about the in-work beta versions. But today I can, because Orbiter 2006 has been released. 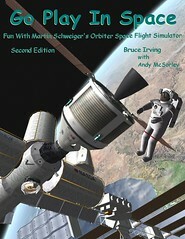 The second edition of Go Play In Space is also done and is available on new co-author Andy McSorley’s Virtual Space Flight web site, and also in the Orbiter wing of MiGMan’s Flight Sim Museum. MiGMan is also hosting most of the new Orbiter files as one of several mirror sites (thanks, Pete - if new files are not there for download, they will be soon). Orbiter 2006 has some great new features, including support for high resolution level-10 planetary surface textures, improved physics modeling, “visual helpers” that dynamically show the forces acting on your spacecraft, and enhanced lighting effects (spacecraft can now enter a planet's shadow). But my favorite new features are in the usability department. The no-panel “glass cockpit” view now has buttons for all the basic controls, so you can fly no-panel add-on ships without remembering dozens of key commands. The Scenario Editor is amazing – you can change virtually anything about a scenario as it’s running, visually and interactively. You can even add new ships, position and orient them as desired, then click the Save button and you’ve got a new scenario. Set up specific orbital elements, formations, docked ships, etc. Another great feature is the flight recorder – it records the states of all your ships so you can play back the flight and see it from any viewpoint. It even records time compression to allow long flights to be saved without generating huge recording files. Recorded flight files can be edited to add text that plays back with the scenario, providing explanatory commentary or training notes – great for tutorials. The new release includes several of these annotated tutorial playbacks (a couple by me). Playbacks are not “videos” – they are actually running in Orbiter, so just open the playback control, press the STOP button – and you are flying the spacecraft. I will be adding some more pictures from the 2006 version to my Flickr site in the days to come, and also writing about some cool things you can do in the new version. It’s a big improvement on an already excellent space flight simulator. And still free. N.B. One good thing is that with few exceptions, add-ons that worked well with Orbiter 2005 will still work well in the 2006 version, including DanSteph’s essential Orbiter Sound 3.0.